Can we just take a moment to take in that beautiful cover? I'm absolutely loving it. Now we can all join in together and hate that February is so far away. I've been seeing this mentioned on my Twitter feed and desperately want this one. It involves a Rapunzel retelling, but we will also get to see our old favorites, like Cinder and Scarlet. It doesn't hurt that I hear Thorne is the love interest, which I so guessed in my interview with Marissa Meyer earlier this year. Yes, please. Not a book, I'm wishing for a off from school! Haha! Well, have you read the other two in the series? Thank you! That cover is gorgeous! I've heard so many people rave about the 1st two books -- maybe I'll finally give them a try! I own both the first and second but haven't read Scarlet yet! I can't wait though! I can't wait :) I enjoyed both the first and the second book! Great pick. Yes! I'm so excited for Cress, too. :) So many people on Twitter have ARCs, and it's driving me batty. Agreed! I kinda drool every time I see someone say they have it/post a picture. I absolutely loved Cinder! I tried reading Scarlet, but for some reason could not finish it :( I'm going to try and read it before Cress comes out! Rapunzel is my favorite fairy tale, so I'm really looking forward to this one! Oh no :( I didn't like it as much as Cinder, I have to admit that. So pretty! And eek I still need to read Scarlet. Must get on that! Hope you love Cress as much as the other Lunar books. Yes! So agreed. I can pretty much skip Scarlet and her whole thing, I need more Cinder and Kai PRONTO. I'm excited about this, too. And hey, I hadn't seen the cover for it yet, so that's pretty cool! Thanks for featuring, missy. I want Cress so bad!! I really wish it would come out sooner haha. I hope we both get it when it comes out! I have heard nothing but good about these books, and I agree regarding this cover's beauty. I hope you enjoy Cress as much as its predecessors! Thank you! WAIT, does this mean you haven't read them yet? EMILY. As for me, (aside from Cress anyway), I'm waiting on Dorothy Must Die. The twist on the classic story sounds crazy interesting! I am totally with you there. It looks fantastic. Thanks for sharing! Great pick! 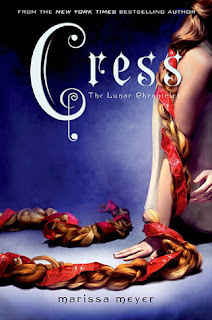 I´m also looking forward to read Cress. Love the cover. Oh no, get on it, Jasprit! I adore all things Rapunzel, and that cover is divine. Too bad the ARC doesn't have it, but hey, that's why I purchase finished copies, right? Can't wait to get to this one! I hope we both love it!!! It really is, but I would gladly have an ARC to read and then go buy the real thing after it's published :) Me too, Jen! My younger sister loves this series! I still haven't read them yet, myself, but I know she's dying for this book to come out.